It should be a fun bank holiday weekend as our very own Jim McKee is playing at the kids Halloween party in the hall on Saturday. Jim has a beautiful voice and is guaranteed to get everyone up and dancing, lashing out the tunes on his guitar. 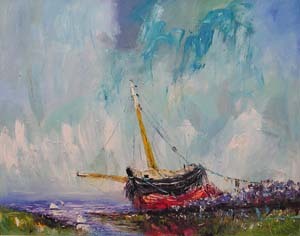 Jim is an all round artist also painting local themes in oil. My favourite song of his is ‘Cuban room’ about improvising and creating something out of nothing. Recently there was a movie shot in the village ‘Seven songs for Amy,’ a romantic, feel good film about a musician trying to win back the love of his life (a hot press journalist). After hearing Jim play in Tullys one evening, writer/producer Fiona Graham approached him and asked to include his song ‘Soul Friend’ in the soundtrack. He was then asked to come up with the title song ‘Amy’, which he did. I was sorry not to have signed up as an extra as nearly everyone in the village did and were wandering around in costumes for a few days having a great laugh. They moved on to Lough Cutra Castle to film the wedding scene and from all accounts the partying after production was wild. I am very happy to have started a course of Qi Gong. I knew if I held out I would find it near Kinvara, and I have, in the Amber healing centre in Ballindereen, 15 minutes away. It is very powerful. The main posture, where you begin all the movements, is standing with feet slightly spread and bended knees. You spend most of the hour in this position and I was amazed to hear the teacher saying ‘Now get into the horse stance’. No wonder I like it. I have named the young pony Solas na Gréine. I call him Sunshine. He is doing well with the long reins although he got a fright walking back to the shed and managed to fall over on the concrete skinning his hip, elbow, knee and fetlock. Luckily it’s only superficial and nothing has swelled up. Also this week I planted 150 crocus bulbs hoping for a bit of colour next Spring.